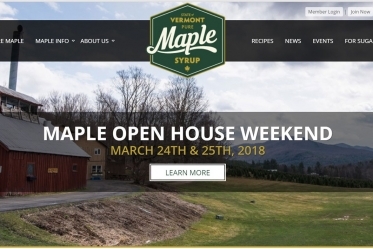 Maple syrup contests are as much a part of the tradition of sugaring in Vermont as setting taps and boiling sap in the spring. 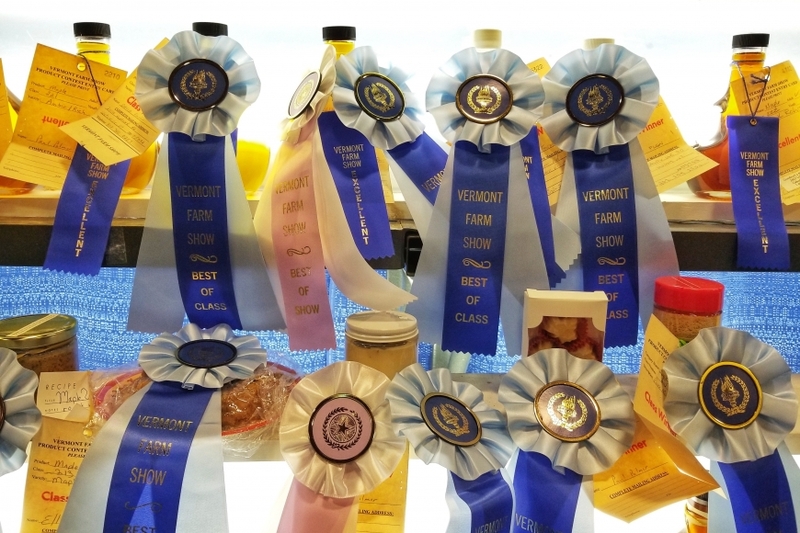 Whether it is at the Vermont Farm Show or the many county fairs and field days, Vermont sugar makers are proud to enter their syrup and maple specialty products in contests to compete for blue ribbons. It's a common sight in sugarhouses to find those blue ribbons displayed prominently, a proud showcase of how a sugar maker's syrup stacks up against their peers. The Best of Show Maple Syrup was Howard Beaupre's Amber. Congratulations to Howard! In addition to syrup, there are categories for Maple Products which include pure Maple Candy, Maple Cream, and Maple Sugar as well as Maple Fudge and Maple Specialty Products, the latter of which can range from maple vinegar to maple baked goods. Maple Cream starts as pure maple syrup and is heated to about 22-24 degrees above the boiling point of water in order to create a thicker syrup with a lower water content. This syrup is then cooled and stirred. The stirring helps to create fine sugar crystals, turning amber colored syrup to a whitish-tan and extremely delicious pure maple product about the consistency of smooth peanut butter. The class winner in this category this year is Paul Palmer, Palmer Lane Sugarhouse in Jericho, VT. Maple Sugar Cakes, or Maple Candy, is pure maple syrup that is cooked beyond the stage used to make maple cream, thus removing more water from the syrup. The syrup needs to be cooked to about 32-34 degrees above the boiling point of water in order to concentrate the syrup. This syrup is then allowed to cool slightly and is stirred to create sugar crystals and poured into decorative molds. Once the syrup hardens and cools it is removed from the molds and is ready to eat. The class winner this year was Paul Palmer, Palmer Lane Sugarhouse in Jericho, VT. Maple Sugar is exactly what it sounds like – pure maple in a granulated sugar form. To create maple sugar, syrup is cooked longer than the syrup used to make maple candy, heating the syrup to 45-50 degrees above the boiling point of water in order to remove even more water from the syrup. The syrup is then cooled to about 200 degrees and is stirred, creating sugar crystallization within the syrup. After the sugar crystals are formed, the now dry, granulated maple sugar is sifted to achieve a uniform consistency within the sugar. The class winner for Maple Sugar this year is Pure Gold Sugaring in West Burke, VT. Maple Fudge deviates from the above products in that entries may contain nuts, cream, or butter. The class winner this year is Ellen Stark of Williston, VT. Maple Specialty Products is a broad category that can contain anything made with pure Vermont maple syrup. Entries this year included maple cookies, vinegar, cinnamon glazed pecans, spicy onion marmalade and more. The class winner was spicy maple mustard made by April's Maple of Canaan, VT.